The biggest Track & Field team Lynbrook has ever had in school history. McKayla Plank (Mitty): gets some coverage from the Mercury News. SJ Mercury News: Spring Track Athletes of the Year. Olivia's Miles: 5K and 1 Mile race results. Great turnout (close to 400) for a 1st year event. CCS Post Season Meeting: will be held at the CCS Office (1691 Old Bayshore Hwy) on Tuesday, June 7th at 4:00. Saratoga News: Pham (Lynbrook) and Follmar (Saratoga) are covered in the news. 400M Training Articles: Two different approaches with some common results: Clyde Hart coached Michael Johnson & Jeremy Wariner. Stan Dowell coached Lee Evans. CCS Finals: Yvan Pham makes it on to States with his 2nd place finish in the 300IH. San Jose Mercury articles. Saratoga News: Follmar and Douglas of Saratoga get some good coverage (look close and Jensen of Lynbrook is behind Douglas in the picture). CCS Dope Sheet: Mark Foyer (Half Moon Bay Review) takes a crack at who's going to finish in the Top 3. And a late-night mystery "dopester" jumps into the fray - see their predictions. CCS Trials: MayC Huang, season PR (5:08.54), Justin Teng PR (49.40), Sameer Thadani (11.37), Luis Jensen (2:04.79), Yvan Pham (39.35). San Jose Mercury News article. SF Chronicle: Nice article on CCS athletes. Athlete Of The Week: Gancayco (Mitty) and Carter (VC) are the Mercury News Athletes Of The Week. Steroid Education: Is on the horizon for all us coaches. CIF has endorsed and passed an education program - time frame TBD. SCVAL Qualifier: Let's see... a school record (38.58) by Yvan Pham in the 300H, a tied Soph record (11.33) in the 100 by Sameer Thadani, a #4 All-Time mark (50.33) by Justin Teng in the 400, a #18 Senior mark (2:02.44) by Luis Jensen - what a day for the folks on the track! DAL Finals: Jason Wang wins the F/S 3200, 1600, 800 and runs on the 2nd place 4x400 team, the best performance by a Lynbrook distance runner that I know of. Summer Track Camps : Some are already starting to put their programs together. This is from the Silver Bullets - Sign-up form. Vs Los Altos: A tough meet. Varsity Boys & JV Girls loose their undefeated status - will have to wait for leagues. F/S Boys come down to the 1600 Relay and are victorius. Vs Wilcox: Varsity Boys & JV Girls continue to win, making a "show-down" with Los Altos for the two undefeated teams in the League. Cindy Ju PR's in the 800 with a 2:45 finish. CCS Team Champ? : Take a look at what school has the inside track for the CCS Team Championship. Top 8: Yvan Pham finally dips under 40 in the 300IH making the only PR for the day for the Vikes. SJ Merc News stories. Athlete Of The Week: Alicia Follmar (Saratoga) with her two wins and one 4th at Hampton/Phillips. Then take a right onto Union. Go to the third light (the end of Union) and turn left on Blossom Hill. Turn Right on the second light HARWOOD. Go over the first hill and we�ll be waiting on the base of the second hill. STRETCH< DRILLS< 800 meter IN/OUT<8 x 150 at 80 % with 4 minutes rest in between. Hampton/Phillips: Saw season PR's for Josh Wang, MayC Huang, Bryan Lin to name a few, with coverage from the SJ News - while the Serra Top 7 meet got PR's for Teng, Xiao and Pham, with pictures to boot. Vs Milpitas: Big day - VB & JVG remain undefeated while the F/S Boys pick up a win as well. VG had a tough time with a great Milpitas girls team. Cindy Ju is a triple winner for the JV Girls taking the Mile, 880 and 2 mile. Pictures are here. Athlete Of The Week: Julie Dufresne (Harbor) is tops in the Shot and Disc this season. Arcadia Invite: Pham & Chan get PRs while Teng gets a season best PR. Get opportunity for all to see the 'Big Boys' - looking forward to next year. Pictures. Alyssa Gagliani (Burlingame): is having a great season - why? - because she's alive. Read more...04/11 update. Athlete Of The Week: Goes to Ben Sitler of St Francis HS for breaking the meet record at the SF Invite this past weekend. F/S Top 8: Tsai PRs with a 5'00 HJ and Wang drops 10 seconds with a 4:46 1600 time (PICTURES). Then the next day at St Francis Invite Xiao PRs with a 17.0 110HH mark (PICTURES). San Jose Mercury: "Cool Kid" Evelyn Wing of Valley Christian. N Salinas F/S Invite: Has been rescheduled for April 23rd. Click on link to the left for meet info. San Jose Mercury: Article on the tradition of Pole Vaulting at St Francis HS. Stanford Invite: Teng runs a season beasy 51.72 in the Boys 400 (click here for movie), Pham takes another crack at the 400 IH. Vs Paly: Varsity Boys & JV Girls remain undefeated. F/S Boys came oh-so-close with it coming down to the Mile Relay. Paly girls show they are the best in the League. Click here for Meet Pictures. West Valley Relays: Day 1 got thru with just a little rain - Day 2 was even wetter and yet still fast. PR's by jumpers Jessica Tsai and Joanna Gardner and a #2 All-Time mark in the 5000 for Jason Wang. Vs Gunn: Another great meet with the VG coming down to the Mile Relay (Gunn prevailed). VB & JVG continue their winning ways. Kemp is a double winner with a PR in the disc. MayC Huang debuts in the 300LH and takes second with a 53.7 time. Google has an eye on you! : Your phone # is on Google and with that, they can find where you live. Read the link to the left to see how 'Big Brother' is watching you. K-Bell Invite: F/S Team takes 4th place. Thadani, Fine, relay teams and others all help the effort. Long day - whew. Pictures can be found by CLICKING HERE. Santa Teresa Classic: has been CANCELLED. Anyone who has sent in money will have it returned. If you have any further questions, contact Mike Dudley. Lynbrook WALK-A-THON: Will be held on March 13th - check out the INFO PAGE and print off your DONATION FORM - let's help raise money for the Vikes. Santa Clara Relays: Zhang shows her stuff by starting the meet off right with a win in the girls 58M hurdles (odd distance). Lady Vikes continue to dominate on the track with wins in the 4x300, 4x600 & DMR and seconds in the 4x200 & 4x300 ('B' team). Guys show they're tough in the throws with Kemp and Chan going 1-2 in the disc and Kemp a second in the shot. Also gathering four 2nds on the track. Ed Choi wins the F/S shot. 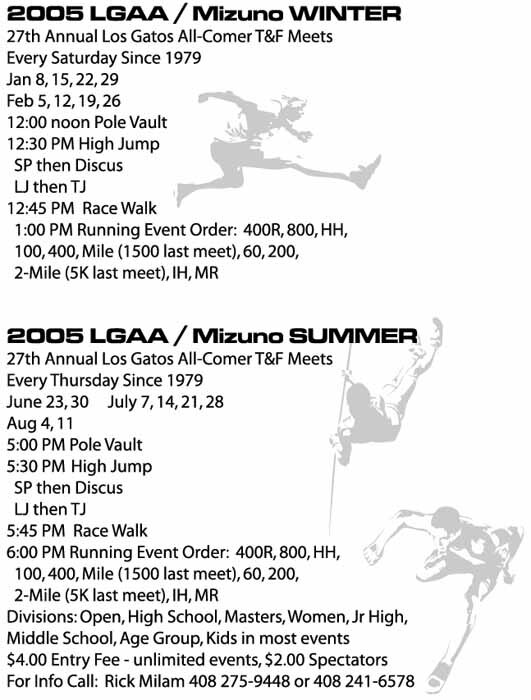 Los Gatos All Comers: Meets start on Jan 8th (12:00 field, 1:00 track) and go for 8 weekends. Check here for results (thru 02/26) as well. Lynbrook Heptathlon: Yvan Pham continued to build on his Day 1 lead while surprise Ken Douglas (Saratoga) jumped from 4th to 2nd (must've been that 2:15 800). Joanna Gardner had a 1 pt lead at the end of Day 1 over MayC Huang and had beaten MayC in the first 2 events of the day - but MayC's 2:40 800 proved to be too much and she surpassed Joanna's total by the finish line. The last 30 minutes of the day were in a rain storm. Both Yvan & MayC now top the Lynbrook All-Time Heptathlon list. Lynbrook Heptathlon: End of Day 1 totals on the Girls side has Joanna Gardner with a slim 1 point lead over MayC Huang (3119/3118) with Elena Moroz (2972) in third. Yvan Pham has a 320 point lead over Sameer Thadani (3103) who only has a 1 pt lead over Andrew Xiao (3102 in 3rd). Iraq Slideshow: I can't comment about the website but this slide show gives you a look of our military in Iraq - nice music too. 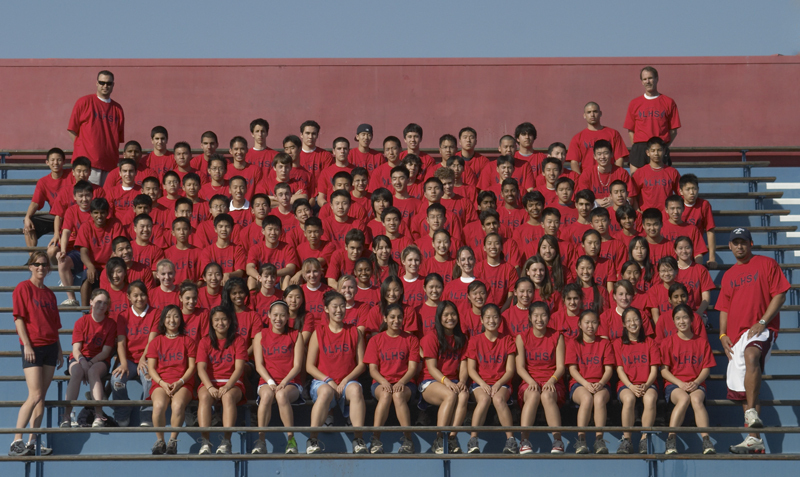 Santa Teresa: Community Track & Field Day - this Sat (2/12) - check it out. DVC All Comers: Meets start on Jan 8th (2:00 field, 2:30 track) and go for 4 weekends. Check here for results (thru 01/29). Ethics in Silicon Valley: Ethics. Has been getting alot of print in the last 12 months in the Silicon Valley. SJ Mercury had a story in Sundays paper. At Saratoga Pres Church in Saratoga, there is a 6 week class starting Wed (2/9) from 7:30-9:00 PM called "Effective Living - An introduction to Christian Ethics". CA Coaches Alliance: The California Coaches Alliance is in danger of losing its seats on the State XC/Track Advisory Committee due to lack of membership. DA/Alumni All Comer: A solid thumping by the De Anza Varsity took down the Alums 85-49 and the ladies were also beat 33-0. 5000 Mile World Record : Check out the still standing WR in the 5000 Mile Relay set by Sunnyvale HS after the '66 Track season (although word has it that Wilcox HS broke the record the following year). Milers & 2 Milers : Thanks to "Malmo" for putting this chart together of Prep Milers/2 Milers times since the 60's to present. Data was gathered from Jack Shepards year end Annuals. State Advisory Meeting : Minutes from the State Advisory Meeting held on Jan 18th. Covers both XC & Track - please read. SCVAL Coaches : Track Pre-Season meeting is scheduled for Jan 18th, 4:00 at Los Altos HS in the Library. CCS Pre-Season meeting is set for Jan 10th, 7:00 at the CCS Offices. Track Returnees : Take a look at some of the Top returning Athletes. Ex-Coach Gus Talbot: of Lynbrook is awarded the Silicon Valley Legacy Award at this years Challenge Cup. 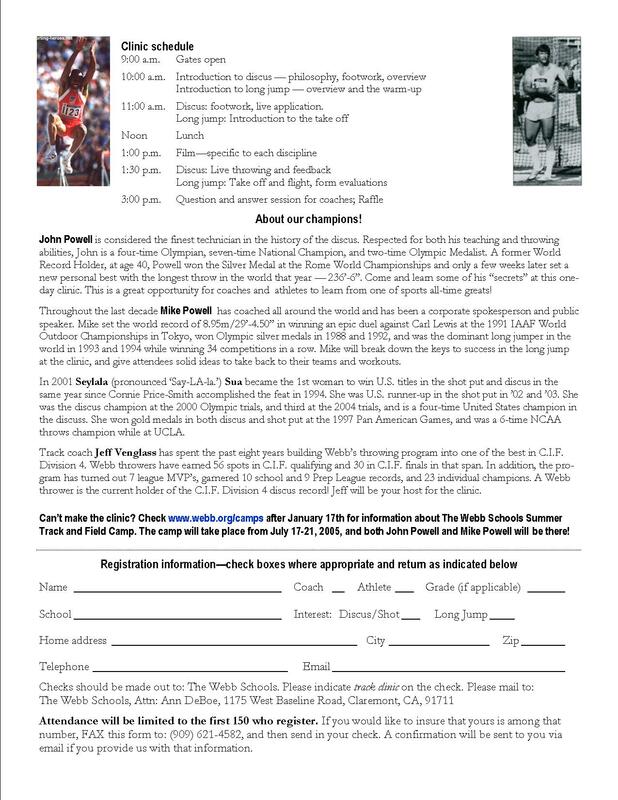 Track Clinic : The week of July 17th - click here for the website. Santa Clara Univ Track : SCU will be starting a mens & womens Track team in 2005 to go along with XC. T & F Rule Changes : From the National Committee on Rule Changes. SkyJumpers : Are you a Pole Vaulter? You might want to check this site out. UNR Indoors : U.N.R. will be having 2 meets this year. One on Sat, Jan 29 and another on Sat, Feb 19th. What?! : What ARE you doin? thinking of track? It's still XC season, so go to: 2004 Cross-Country. CCS Top 100 : CCS All Time Marks have been updated from last years track season - check it out.